or the Experience API in case you have heard or read additional posts elsewhere, it will herein be referred to solely as xAPI within this blog post). The concept is everywhere… you are reading blogs left and right explaining what it is and its characteristics. Some a lot more easy to understand than others. 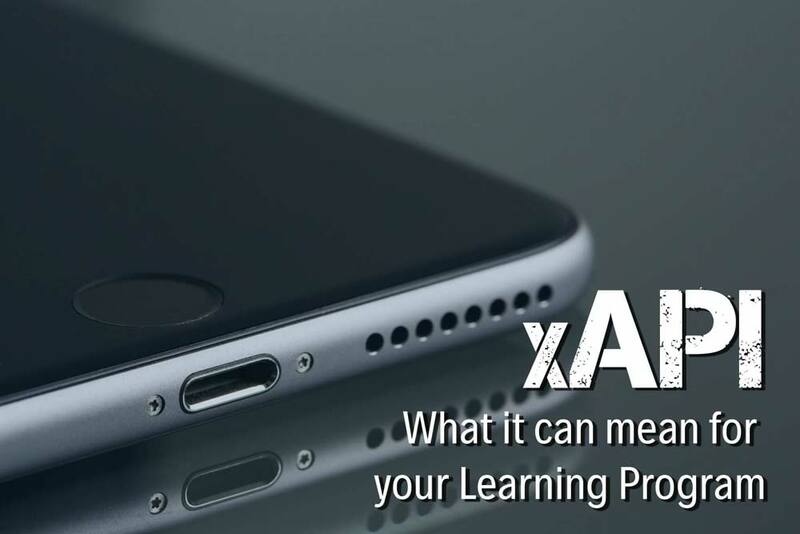 But in general, you realize that xAPI definitely can go a long way in expanding the capabilities of some of your more cumbersome components within your learning program. But “how exactly can it do that?” And really, “what is it?” According to Tincanapi.com (which also exists as experienceapi.com to suit your fanatical naming convention’s needs), “xAPI is a brand new specification for learning technology that makes it possible to collect data about the wide range of experiences a person has (online and offline). This API captures data in a consistent format about a person or group’s activities from many technologies. Very different systems are able to securely communicate by capturing and sharing this stream of activities using Tin Can’s simple vocabulary.” Why is this important? Well, previously these data points had been collected over various other protocols, specifically focused on E-learning and Instructor Led Training (ILT), while now, this universal type of data encapsulation ensures interoperability between new learning objects within your system and the outside world. What does that mean to my learning program? Think of your learning program like it is an amusement park full of intense rides, arcades, and entertainment. In general, you would be satisfied in knowing that the only reason people are there is to ride the most insane breakneck ride in the park, and that is why the queued line is always so long. But, what if I told you that people actually go to the amusement park for a variety of other reasons. Some people really like an excuse to walk around and eat carnival foods, others dislike roller coasters altogether and really enjoy watching live acting, and others are obsessed with video games, but really just need an excuse to get out of the house. In order to identify what motivates people to go to the parks, their overall experience would need to be measured. Experience Tracking (The reason xAPI is also known as the Experience API) is a very real component of the xAPI offering. Objects that begin as strictly online E-learning, do not have to end that way. Interactions throughout the process are carried out on a variety of devices and in an abundance of ways allowing for an all-encompassing view of the learners’ involvements. If there is a social component of the learning mix, if there is a game that aids in the specific development of a particular course, it is now attributable to a single data node. As a whole, the intent of xAPI is to aid the flexibility of the entire system, as well as the way in which we measure our learnings. Learning is no longer confined to typical methodologies, this opens up the avenues towards Social Learning, Mobile Learning, and Gamification. SCORM is not designed to track these learning approaches. SCORM is not going away, you can continue to use your currently established SCORM to track end to end utilization of various learning objects. However, in the xAPI Format, the administrator can view Learning objects from a broader perspective (as well as institute a variety of objects which were not originally considered part of the learning blend). Such as, if the user has asked for help on connected social media, contributed to the learning environment via discussion boards, or if the user photographs or screen captures relative content. This specification should be exciting to industry personnel as it extends the outreach of our user metrics. Further understanding our users and how they interact not only within, but also outside of their learning environment can provide a vital knowledge component that was once missing from our analytics in order to determine courses of action in our programs. Try not to be afraid of new technologies, the learning space is continuously evolving and as the tools get better, our abilities expand as well. As your program begins implementing social learning and gamification initiatives make sure the environment in which they are being provided is capable of fully measuring these features and their utilization. You don’t have to take your learning amusement park at face value, use xAPI to learn how users are crafting their own experiences and use this information to further establish methods for success within your implementation. As always, remember to join us here at the Gyrus Systems Blog as we continue to investigate buzzworthy components of the learning and development field multiple times a week; don’t forget to subscribe to our blog (subscription form on top right of this page) to have the latest blogs delivered straight to your email inbox.